Our teaching concept is based on current scientific findings from brain research, the application of which has already shown a significant positive impact on teaching and learning. Just as movement positively influences learning, emotions also affect it, with anger obstructing and joy motivating this process. Learning processes are more effective when the interests and ideas of the learners are taken into account. Here are just a few examples. This emerging discipline is known as educational neuroscience. The cultural and linguistic diversity of our target group required a pedagogical tool that would make it possible for the participants to achieve intercultural communication through verbal and non-verbal interaction, and between German-speaking and refugee girls, in a motivating and challenging environment. This interaction should serve to place value on and recognise diversity. Inclusive pedagogy provides the framework for this. In order to overcome the (almost) insurmountable language barrier, a communication aid is necessary. A communication aid is anything that helps people to be more effective in communicating within their environment. In the framework of our project, we have used the communication folder from Prof. Boenisch and his team (Research and Consulting Centre for Supported Communication at the University of Cologne). The target group for this communication aid are children and young people who cannot speak due to an impairment, because they have no or very little spoken language. The girls in the group used the communication folder to understand each other during the workshop and also to learn German. The communication folder consists of symbols, letters, numbers, phrases and affixes, which are added to a word and thus form a new one. 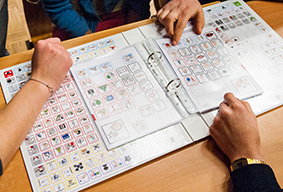 The words found in the materials are based on spontaneous speech from children with and without impairment. It is full of words that we use very often. These words are versatile and always appear, regardless of what we are talking about. The 200 most commonly spoken words in everyday language are denominated “core vocabulary”. These 200 words represent approx. 80% of all words that we use in conversation. They are so-called small words, such as "be", "the", "can".